If you like a trendy look that's outside the norm, but if you need room and versatility, the Murano might be a good fit. Great family vehicle for people who tend to lock their keys in their car. This car is one of the smoothest driving cars I have ever driven. The back seats are very spacious and there are two buttons the driver can set his car seat and pedal adjustments on. Overall it is a great family vehicle - there are a couple things because of user error and maintenance that are a bit frustrating but nothing that can't be fixed. For instance on the screen you can check your tire pressure, well 2 of our sensors are broken and it doesn't tell you which two- you have to do process of elimination when filling up your tires. Also don't accidentally wash your key fob. The doors come with a button that if you have the key fob within a certain distance of the car it will unlock. We washed it and its short circuited. Luckily though there is a key entry so as long as you still have the key you are ok. Another great feature is that there is no way for you to lock the keys in the car. There is a security feature that makes it impossible to lock the key fob within the car. White 2007 Nissan Murano with tinted window very good on gas ac works prefect. My vehicle is reliable it's the perfect car for me its white four door with cream interior with FM/am radio CD player and a maintenance check up. Cold ac with power window and an low jack tracker also excellent on gas the horsepower it's fast. The radio blast to a good level also good on oil change. Has four cup holders very spacious for grocery, luggage, and passenger. Very comfortable seats, power steering wheel with handy radio control the tune and the volume and cruise control. Low maintenance and a great ride. Murano is comfortable and easy handling when driving. Seats 5 with ease. Easy to read gauges and low maintenance. Has gauge indicators from low air in tires to oil changes when needed. Sunroof allows for fresh air without windows down. Ample legroom and compartments for all needs from change to cup holders. Best feature is the keyless entry never have to worry about misplacing keys. Automatic shutoff for lights. Hatchback also great feature for easy loading and unloading if items. 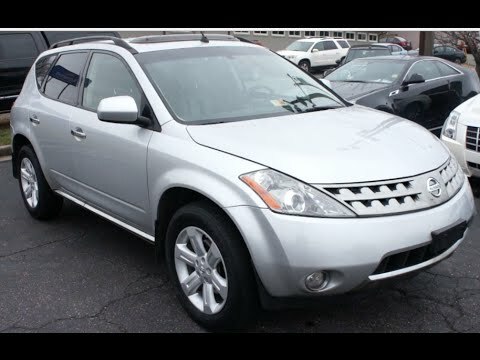 NISSAN IS RECALLING 362,891 MY 2003-2007 MURANO VEHICLES. THE INTAKE AIR DUCTS, WHICH ARE CONNECTED TO THE INTERMEDIATE RESONATOR IN THE AIR INTAKE SYSTEM OF THE ENGINE, MAY SEPARATE FROM THE RESONATOR WITH ENGINE MOVEMENT. THIS SEPARATION OCCURS DUE TO THE PREMATURE AGING OF THE MATERIAL USED IN THE INTAKE AIR DUCTS WHICH CAUSES EXCESSIVE SHRINKING. ENGINE MAY STALL INCREASING THE RISK OF A CRASH. DEALERS WILL INSPECT AND REPLACE/REPAIR THE APPROPRIATE COMPONENTS FREE OF CHARGE. THE RECALL IS EXPECTED TO BEGIN ON OR BEFORE JULY 6, 2009. OWNERS MAY CONTACT NISSAN AT 1-800-647-7261.